This stunning work by Gilles depicts the Basilica and Piazza San Marco in Venice. Producing this image would have required a combination of digital methods to realise the 3-dimensional structures, amidst a backdrop and skyline using digital painting techniques. 3PP is pleased to announce the first in a series of interviews with currently active digital artists. These interviews are designed to showcase the talented persons involved in this modern art form and shed some insight into their inspirations and techniques. ....the grid of the computer screen is the postmodern realization of the traditional perspective grid that isolated the figure in sacred space. 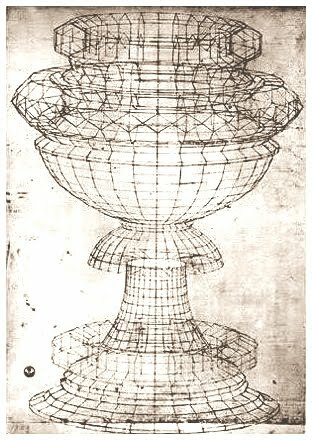 It involves the same universal geometry, with its ideal proportions -- refined with great precision -- that appears in Renaissance architecture, with its grid-like plans and facades, suggesting that the computer signals a new Renaissance of art-making. 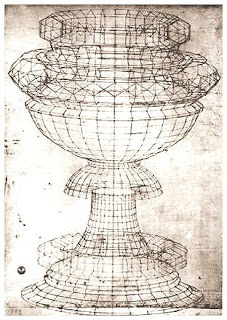 Paolo Uccello's perspective drawing of a chalice executed in 1450. Applying the technique of linear perspective described by Filippo Brunelleschi. Uccello's drawing is the direct predecessor of the advanced 3D imaging software used by digital artists today. Like the Renaissance artist, the digital artist must be a learned craftsman -- an artist who has to learn a craft that is at once material and intellectual -- at a time when a good deal of art seems craftless and pseudo-intellectual, that is, not rigorously logical inwardly and outwardly. Digital art offers new hope for art at a time when the traditional media seem to have exhausted their potential -- however useful they undoubtedly are for individual expression and however socially meaningful they remain -- and thus a new way of revitalizing the traditional media. This is an absolutely perfect summation of the parallels of digital art with the Renaissance - and perhaps explains why I am so naturally drawn to it! Hence, allow me to introduce Gilles Beloeil - who was quite gracious in agreeing to do this interview in English. My schoolboy French would not have been sufficient! 3PP: To those who are unfamiliar with your type of work, how would you describe your current role at Ubisoft? GB: I am an Illustrator at Ubisoft Montreal. I do illustrations and concept art to show the art director's vision of the game to the development team. An image can speak a lot more than a speech! I also do some matte paintings for the game (fake background to simulate a huge environment, for example) and some matte paintings for cinematics or short movies when needed (eg. Assassin's Creed Lineage). From Green Screen to digital reality. Gilles' work helped recreate Florence for the live action short film Assassin's Creed Lineage. Also, if you missed it - read the original 3PP article on Assassin's Creed 2/Lineage here. 3PP: Did you train in the traditional arts before embarking on your career as a digital artist? GB: Not really. I've always drew a lot. When I was a kid, I wanted to become a comic book artist. I've never learned traditional art in school though. Most of it, I've learned by myself, by reading books and also by copying paintings I liked. 3PP: How did you become interested in digital image manipulation techniques? GB: I discovered Adobe Photoshop in 1995 when I was learning website design. I did some photo manipulations with movie posters and pictures of my friends. I thought it was a fun tool to play with, but at the same time I've always been very serious about it. I even bought books on Photoshop and knew that one day I could have a cool job thanks to my knowledge of this software. Packaging and interface for Adobe Photoshop's 1995 Release - Version 3.0. In 2010, Photoshop celebrated its 20th birthday. Photoshop exists in present day as part of the Adobe Creative Suite Platform, and also in modified Elements and Mobile versions for non-professional users. 3PP: How many hours goes into a complex image, such as the images of Rome and Venice you have created for Assassins Creed 2/Lineage. GB: It varies a lot. For a very large and detailed matte painting, it can take up to 2 or 3 weeks. Details need time. The more details the image has got, the more time you need. For an illustration or a concept artwork, it is faster because I do a lot of painting. Also, my technique and skills have evolved through the years so I've become faster. For example, for an illustration that took me a week a year ago, I can now do in a day or two. 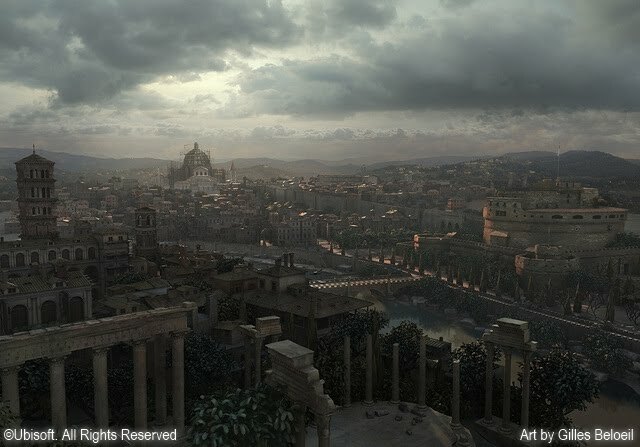 One of my favourites of Gilles' Paintings for Assassin's Creed 2. This ambient landscape depicts a game location near Venice. 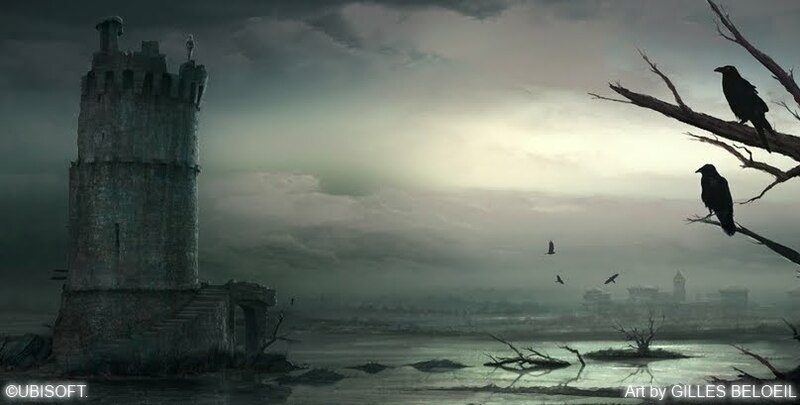 The lone figure of the assassin is seen perched atop a ruined lighthouse. 3PP: When creating these types of images, what different software packages are used - and to achieve what effect? GB: For an illustration or concept art, 90% of my work is done in Adobe Photoshop. If I need a 3D base, I'll use Autodesk Softimage XSI, but any 3D software would do the job. I just do very basic stuff in 3D. The rest is only CG(computer generated) painting. For a matte painting, I'll use a lot more 3D and even rendered passes to have accurate details and better control. But as I said earlier, my techniques are evolving almost every day. Maybe in a year my answer to that question would be different! Softimage rendering demonstration video from Autodesk, showing how lighting effects can be applied to a 3D model of an object. This program is used prolifically by digital artists, animators and CG effects artists in TV and film. 3PP: Do you use a mixture of different graphics hardware? eg. 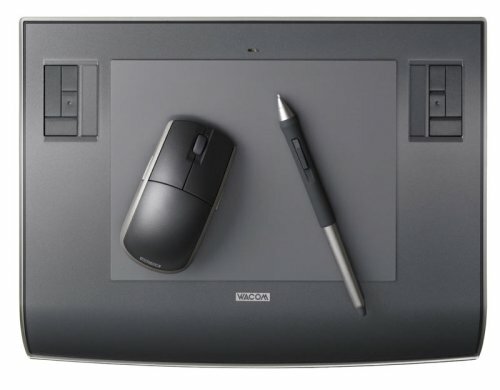 different types of computers and/or graphics tablets? GB: No, I really use basic stuff. Nothing fancy. A PC and a graphics tablet, an old Intuos 3 PTZ 630! That's it! Amazingly, Gilles' superb work is done on such a modest device a true testament to his skill. Tablets are available in all shapes and sizes, but the Wacom 21UX is the Holy Grail for many professional digital and graphic artists. They cost $2000 USD each! 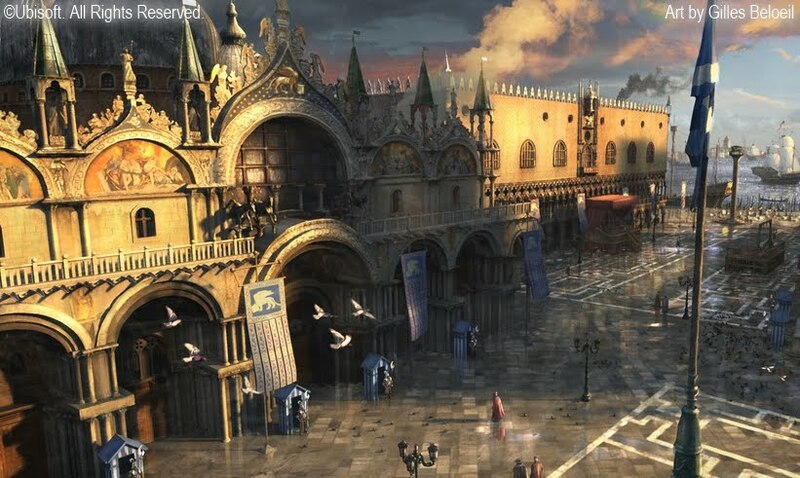 3PP: During the making of Assassin's Creed 2, did the artists working on the project visit Florence, Venice and Rome? GB: Of course! The core team (producers and creative team) did so. They really wanted to stick to the real world as much as possible. They took tons of pictures, which were really useful for artists like me afterwards. Ubisoft Game producers, along with historian and author Marcello Simonetta give some insight into the History of Florence, relating it to player experiences in the game Assassin's Creed 2. 3PP: What tips do you have for aspiring young artists looking to work in multimedia ? GB: If you want to work as a visual artist in multimedia, the first thing you gotta' have is a convincing and wide portfolio. You can showcase traditional drawings, photos, digital works etc... It will be the key to enter in a good school or even to find your first job! 3PP: Artwork involved in the development of games seems to have been more prevalent in Japan - with Yoshitaka Amano's amazing work on the Final Fantasy series being the most famous example. Companies like Ubisoft and BioWare have brought this artistic focus to Western games. What other multimedia artists have been an inspiration or guidance to you through your career? GB: There are a lot of great artists out there. For matte painting, I love Dusso's work. He is always right! He has always been a great inspiration to me. For illustrations and concept art, I personally think Craig Mullins is the best. He's mastering light and that's what I think is the most important. 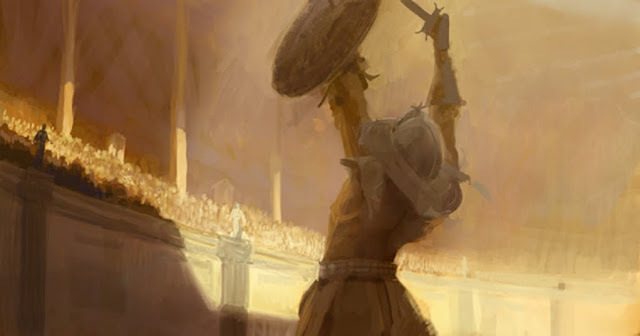 I really love the work of Jaime Jones too. He is another amazing artist. Craig Mullins has produced some stunningly detailed work over the years - though this image is indicative of his painterly ability to capture grandeur and drama in the style of the traditional medium. 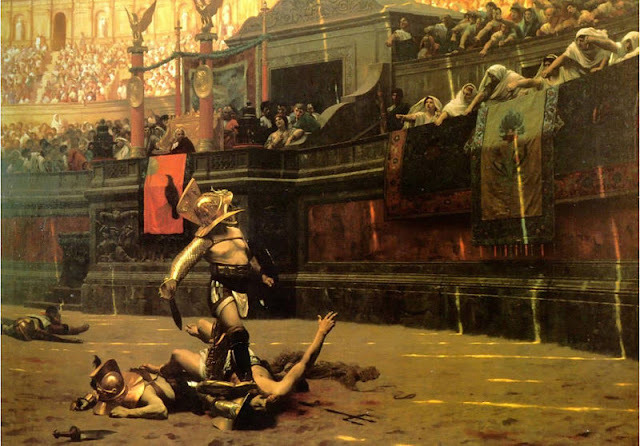 This particular piece seems very much inspired by the 1872 painting Pollice Verso by French Academic Painter Jean-Léon Gérôme pictured below. 3PP: This site chiefly focuses on the artists of the Renaissance and the Baroque era - do you have a particular favourite artist of work from this era? 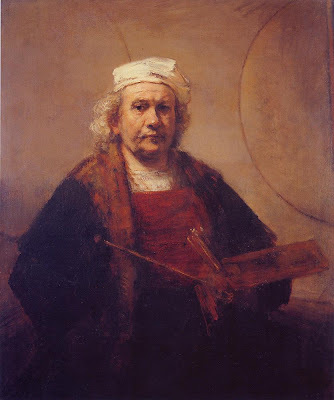 GB: For the Baroque Era, I love Rembrandt, Vermeer and Velasquez. They understood the importance of light and how various subjects react to it. For the Renaissance, of course I have to mention Michelangelo. His drawings are amazing! Rembrandt's Self Portrait with Two Circles alludes to the great virtuosity in all Master Artists. The two circles in the rear of the image are likely references to the tale of the skill of Early Renaissance Master Giotto. 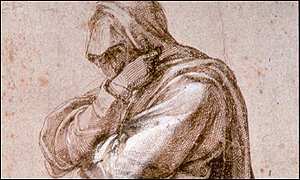 Michelangelo's Study of a Woman Wrapped in Mourning Clothes (c.1494-1504) is a sketch that would look equally at home as a concept work for a video game character. This ink drawing sold for 5.9 Million Pounds. 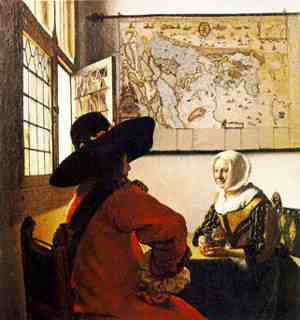 The debate over whether Vermeer used an optical device known as a camera obscura still rages, though the relative dimensions of the figures in this painting perhaps appear as viewed through a lens. The clever use of light and perspective in Vermeer's work makes him a natural source of inspiration for digital artists. Such a fascinating interview! I'm so glad I stopped by! It's amazing that Gilles is able to accomplish so much using relatively uncomplicated hardware devices. It was also interesting read about the learning curve involved. Thank you for this peek behind the scenes! Cheers for the lovely feedback Margaret! I love your site, "Earthly Paradise" - very much looking forward to the Art History Blog Carnival!! Yet another revelation about art trends---a big thank you! Gilles is a superb talent and was thrilled to see the work of Craig Mullins. As usual, your numbering is itself an exquisite work of art. bravo! Cheers Vicki! I am pleased you enjoyed the interview. I have been receiving a lot of great feedback from different quarters - Authors, Art Historians, Digital Artists and gaming fans - all brought together in their appreciation of Gilles amazing work! I'm very pleased about that! If you liked that numbering you should wait and see what is in store for the next interview! I really like the comparison between Renaissance perspective and the digital "grid." It's fun to consider digital art within art historical terms. I also liked your comparison between Vermeer's camera obscura and inspiration for digital artists. What great connections. I'm glad that you are doing this series. Digital art isn't discussed very much in the art historical world. I think the discipline has a bit of a hard time picking up on new trends that extend beyond tactile mediums like paint and marble. Contemporary art historians embrace digital and Internet art more readily, but I haven't seen much discussion about how digital art can be interpreted (and historicized!) within the Western art tradition. It's interesting and thought-provoking. Thanks for the wonderful feedback M! I hope to be showcasing more of these amazing Artists in the future, stay tuned! Wow, this is amazing! Kuspit's quote, in particular, completely reframes for me the way digital art should be perceived. This is an excellent series! I'm glad you enjoyed it Vicky :) Mr Kuspit did an amazing job in his summary - saved me a lot of hassle trying to dream up something similar! well, you already know I love digital art :) Great interview. So interesting to see another artist's process. About 3 years ago, I was in an art class and the teacher said that we have not seen an art movement in over 50 years. I promptly raised my hand to disagree and asked - Isn't digital art the next movement? This teacher disagreed. Thanks for sharing that Bearded Lady! I think it is normal for some to be resistant to change. Such people feel secure in their understanding of how things should be, and are resistant to anything that does not align with it. Luckily, not everyone is like this! I am sitting here completely blown away by the words and the work of a master artist. Assassin's Creed is and will always be my favourite work of digital art. I can only wish to have half of this talent.